They can be helpful. Being able to manipulate a figure and lighting to match your idea gives you a reference unique to your design. Unfortunately, most of these little figures aren’t exactly posable. For a basic shading reference they can work, but once you start trying to get dynamic (or just un-stiff) poses, it proves useless. I almost broke mine (above) once trying to put his arm above shoulder height. When I stumbled upon these figures by Max Factory, I nearly gasped. They bend. And pose. And that’s kind of it but it’s still exciting. Thanks to the accompanying stand, you can also position them jumping and flying. 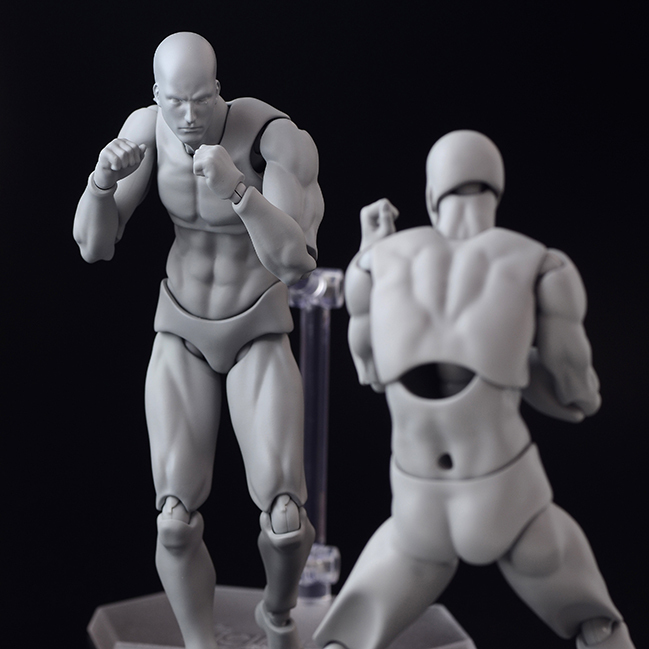 Coming in both flesh and gray colors, the Archetype Next Figmas look like superheroes. The muscle definition on the man seems especially useful, and the proportions of both genders look realistic (if not really toned). Granted, you get what you pay for. My wooden miniature cost about $8 I believe. 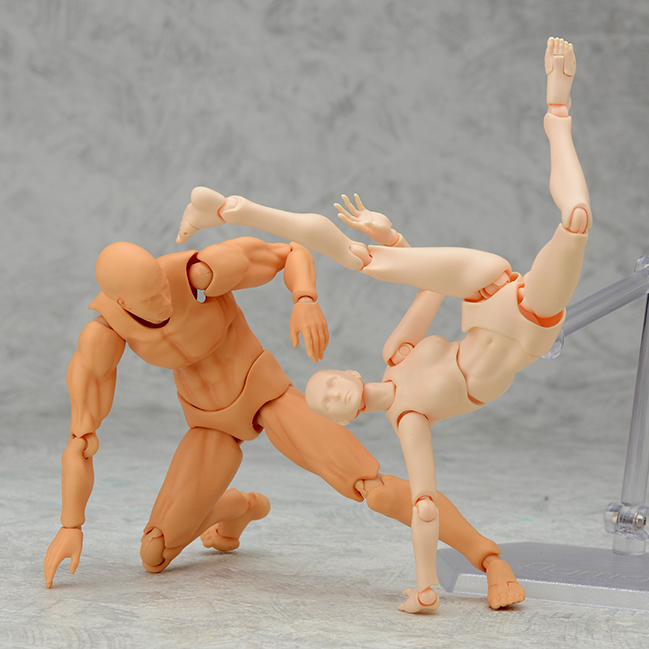 Which is why I shouldn’t be surprised at how these awesome and bendable figures by Max Factory are pretty pricey. In the original sale, they were about $30. Now they’re mostly available in secondhand sales, ranging from $33-$104 on Amazon. So as great as they look, I’ll have to hold off for a while. (You can tell this isn’t sponsored, because I don’t have one and am too broke to buy one haha). But I’ll definitely keep the figures bookmarked for the future. On a side note, I’ve also heard of people using action figures for musculature and pose references. Other artists, like Dinotopia creator James Gurney, build mini sets and models to base their art off of. 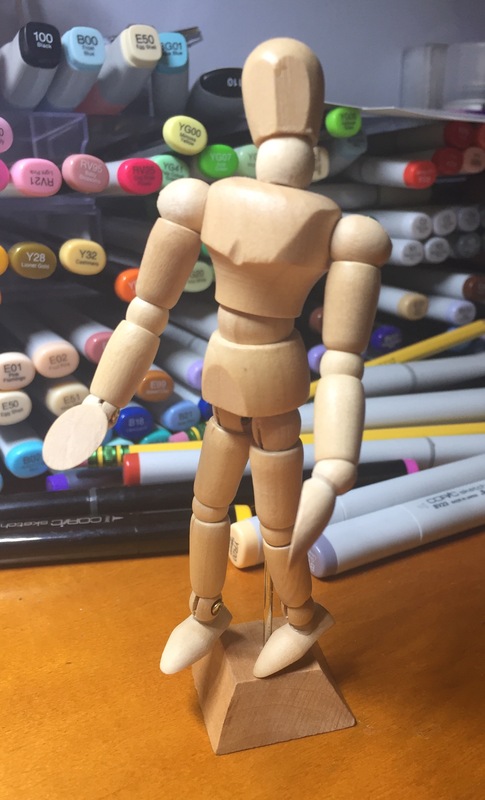 Do you use any figures or models when drawing?